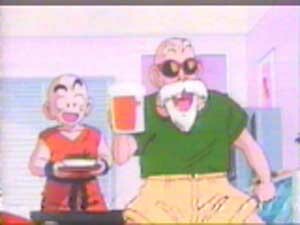 The saga starts off showing a picture of Gokus' house and his son Gohan. curses and says the Kakarot should've wiped out this planet along time ago. flies and finss a little Island. Goku comes out sensing a hugh power level. hasn't earth been cleaned up yet. Goku doesn't understand what he is talking about. very violent boy, until he fell down a cliff and bumped his head and became a normal boy. and says that if they were to beat Radditz they must join forces to defeat and they go flying off. They find Radditz near a farm. Radditz gives Goku one last chance to join him... Goku refuses. huge explosion and tons of dust flying around but when the rubble cleared Radditz was still standing. is too soft hearted to be a great fighter. Radditz escaped and kicks Goku and he goes flying. he burst out of the pod shattering it to pieces.Radditz senses an enormous PL of 1 130.
tell all of the other Z-fighters to train and in one year they'll ne fighting a very tough fight. to be a great fighter. Who is your favourite DBZ character?